Monster iSport Intensity headphones are geared towards athletes who want to own a premium set of headphones with numerous features. It is also proof that Monster is making its way into the lucrative sports headphone market. Driving sound is balanced with noise isolation by the iSport intensity so people will remain aware of their surroundings even when they are using these in-ear headphones. Aside from that, these headphones are designed to never slip. This makes them ideal for workouts and jogs. These headphones also have a handy ControlTalk remote and microphone combination on the cable. It is surprisingly sweat-proof and machine washable. Most notably, they come in a snazzy new color and look much different than other headphones on the market. If a person needs a set of fitness headphones that cost less than $100, this is what they should look to purchase. People like the flat cord design on the headphones. There is also a sliding loop on the cable that is designed to take some of the slack between the right and left earphones. It does not seem to tangle like the rounded ones. Aside from that, the L-shape plug-in adapter seems to be sturdier, and lots of people like this design because it is much better than a straight adapter. It cannot be easily damaged as well due to the extra support on the finish. Users also like the small openings on the molding. This is because it feeds sound directly into the ear canal without having to squeeze in. The rest molding also blocks extraneous noise. People can simply insert the projected opening into their ear and rotate the earphone around in order to settle it comfortably. Users like the additional features found on the phone. The jack on the end of the headphone plugs in at a 90 degree angle rather than sticking straight out from the socket. People also like the small plastic clip that enables them to anchor the cable to a convenient spot on their clothing. Many people also like the headphone sound quality. The sound produced is smooth and clean enough while the bass is loud and has a decent kick to it. The quality that it offers is as good as that found in other similar models such as the iSport Immersions. Users also like the phone’s ControlTalk feature. This enables them to avoid turning on their device in order to pause music or switch songs. With ControlTalk, they can do it all from a switch on the cord. People also like the fact that the Intensity comes with large, medium and small ear molds. This enables them to find the right ear molding that fits them comfortably. In addition, users like the soft carrying pouch that is included with the headphones. Although the green cable gives the headphones a distinct look, some users claimed that it is poorly made. The skin where they connect it to their iPhone peels away, and they can see the copper cables. Aside from that, some people think that a strange sound can be heard when turning the volume a bit high. Some users do not like the green cable coloring. Others also claimed that the in-built microphone on the headphones is weak for phone calls. A number of users even claimed that their friends can barely hear what they are saying. The burn-in process also takes a lot longer than usual. It takes 100 hours to achieve what only takes competitors 50 hours. 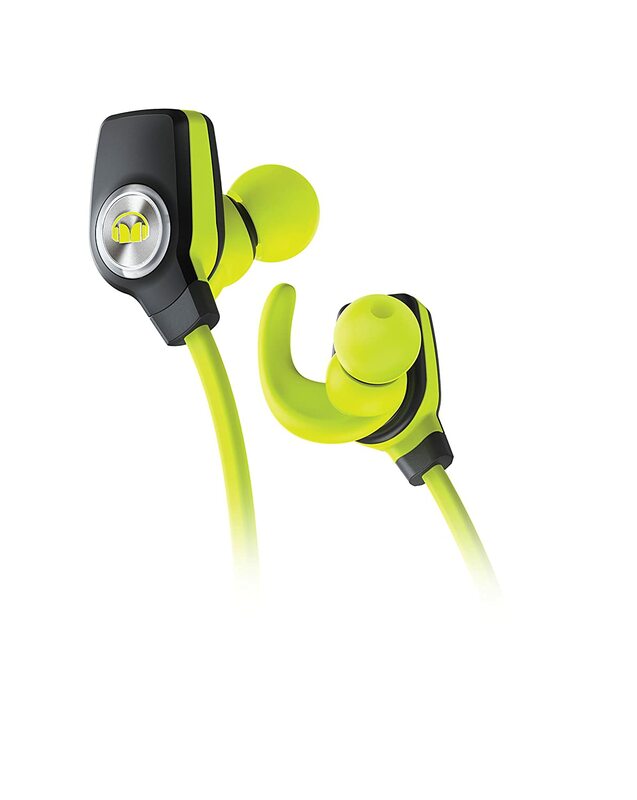 Although Monster has stated that the headphones are sweat resistant, they cannot handle sweat. There are reports that the headphones stop to function after two to three weeks of intense workouts. Although the Monster iSport Intensity has a number of features that Monster should definitely improve on, it is still a product that is worth the purchase. It is comfortable, safe and easy to slip into the ears. The sound quality is also very good especially when it is used in a quiet environment. Unlike its competitors, it also has an Apple-friendly inline microphone and remote for making cell phone calls. The price tag is less expensive than similarly designed sports earphone models from Bose. All in all, these headphones balance both sound quality and design at a very competitive price.